Kazakhstan is a beautiful country situated in Central Asia with a splendid view of mountains over the horizon! Have a look at the map of Kazakhstan. As you can see the west of the country is partly in Europe, while the rest is in Asia. Kazakhstan is the world's largest landlocked country by land area and the 9th largest country in the world. There are a lot of places you must to see and our NMO will help you with it! 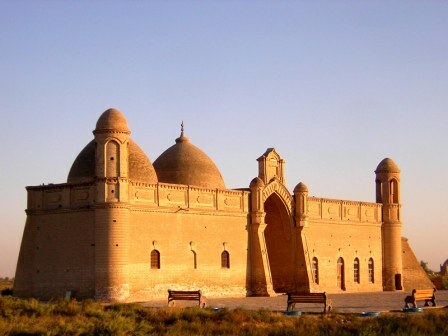 LC IKTU-Turkestanis situated in Turkestan town. Its situated South Kazakhstan Region. Turkistan is a very old city. It is also known as one of the oldest cities of Kazakhstan. There are many historical places and buildings there. Hundreds of tourists and guests from around the world and Kazakhstan visit the one of the oldest buildings –Mausoleum Khoja Akhmet Yesevi. Khoja Akhmet Yassawi International Kazakh-turkish university has many faculties. Medical faculty is the biggest faculty. Nearly 4000 students study in Medicine faculty of the university . There is a big university town in Turkestan. Students can find there anything they need .Medicine faculty has 2 buildings. And there is a clinic of the faculty. Pre-clinical clerkship will take in those buildings(center simulation etc,). Information about hospitals where the exchange take place. Clinical clerkships will take in Yassawi clinic which is situated university town. There is a big students canteen for students in the students town –Titanic. The price of meals is not expensive BUT very tasty. Students can have their lunch and dinner there. Well of course there are also many cafes and restaurants near the clinic and university. But every building has canteens so students can have some tea anytime they want. Students will stay in students hostels. The 1st ,2nd and the 5th hostels. 2-3 students stay in 1 room .Every 2 room have a gas cooker, fridge ,tables, cupboard ,sink, a toilet and bathroom .There is a bed ,wardrobe ,2 tables in every room. Smoking and drinking hard drinks is forbidden hostels. There are special laundries in every hostel, where students can wash their clothes with washing machine and iron them. But they will have to bring their washing mean (tide,arieletc,) with themselves or they can just pay for it. The easiest way to get to the town is IF you are coming by plane then you will be in Astana or Almaty international airport . Almaty international airport ---buy ticket for plane from Almaty to Shymkent(you will not have a problem with that). When you come to Shymkent International Airport you can take a taxi to Shymkent Bus station(there are 2 bus stations ,but you can go to Turkistan from both of them).You can find a mini bus or taxis there until Turkestan. It will take about 1,5-2 hours from Shymkent to Turkistan. When you come to Turkestan we will be waiting for you in Bus station. You can also come to Turkestan from Almaty (Astana ) by train or bus. But it will take much time (20-30 hours by train ,15-20 hours by bus. 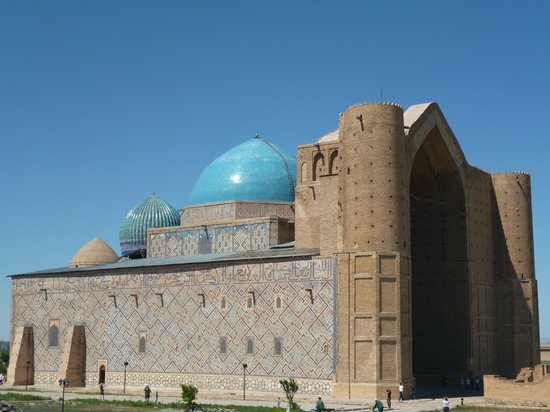 The mausoleum was built on the burial site of the Sufi poet Khoja Ahmed Yasawi, who had great authority among Muslims in the region and had an impact on Islam in Central Asia. The photos were taken by Ilia Afanasieff.The existing building was constructed more than 200 years after the death of the preacher by Tamerlane’s order (in the late 14th – early 15th century).